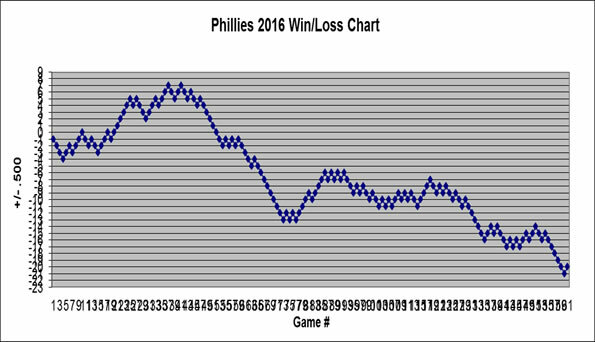 Last night might have been the last straw for Phils' closer Brad Lidge. Charlie Manuel has done everything in his power to straighten out Lidge in the hopes that he could slightly resemble the guy who was perfect last year. If he could right the ship, Lidge is far and away the best option for the Phils. But, I think last night's performance showed that he just doesn't have it this year. He not only blows saves, but he loses the games. He has not had control of any of his pitches all season, and last night was a perfect example. Even with an 0-2 count, he was throwing pitches right down the middle. That just does not cut it. It has a bad connotation, but I feel that "closer by committee" is the best option. Ryan Madson has shown that he does not deliver with the label of "closer," and making him the official closer leaves you in a bad spot again if he can't perform. Why not handle your relievers exactly like you do with the rest of the innings? If the eighth inning has lots of righties you can use Madson, Myers, or Durbin and if the ninth has a bunch of lefties use Romero or Eyre in the ninth. And just mix and match in between. Maybe someone will emerge as your closer through experimentation. I feel that Pedro Martinez is a viable second option. He has the toughness that I want in a closer and experience in big game situations. He may not have overpowering stuff, but he throws strikes, and Brad Lidge has proven how hurtful walks can be. I don't buy into the argument that Pedro has struggled in the first inning. Many times what you throw in the first inning is to set up what you do in the sixth, seventh, and eighth inning. Closing is a different animal, and I am confident Pedro can at least hold his own. The final question: does Lidge make the post-season roster? I hate to say it, but my answer is no. Charlie has said Lidge is not a set up man or middle relief pitcher, so it does not make much sense for him to make the team. If Lidge turns it around in the last two weeks, I would love to change my mind. And if he does, it would still be nice to have Lidge as a closing option. Philadelphia Phillies fans will not and should not ever forget what he meant to this city last year. And we have him for two more years and are a much better team with him. But for now, we need to do what is best for the team and his teammates, and that is for him to honorably step aside.